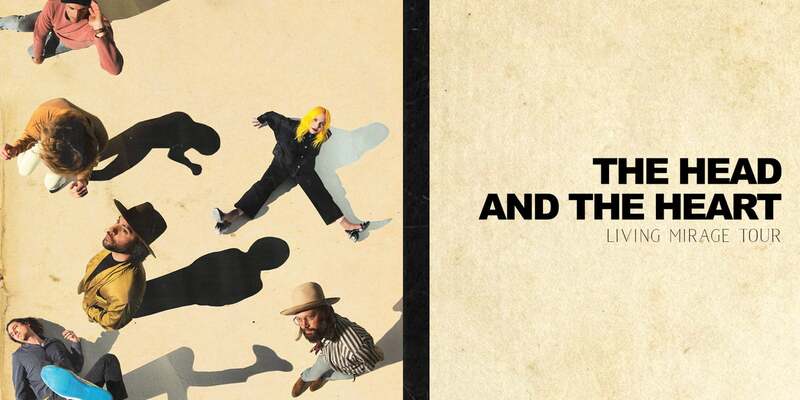 The Head and The Heart return this spring with their 4th full-length album, Living Mirage, featuring newly released “Missed Connection”. Initially self-released in 2011, The Head And The Heart’s self-titled breakout debut produced instant classics including “Rivers and Roads”, “Down In The Valley” and “Lost In My Mind” and is now Certified Gold. Their last two albums, 2013’s Let’s Be Still and 2016’s Signs of Light, settled into Billboard’s Top 10 albums chart, with Signs of Light securing the #1 position on Rock Album Charts. It also produced the single “All We Ever Knew” which reached #1 at Alternative, after holding the #1 spot at AAA for 9 straight weeks earlier that same year. They have appeared in Cameron Crowe’s Roadies, with music featured in countless other commercials, films and show, among them Corona and Silver Linings Playbook. Having played consecutive sold-out Red Rocks shows and prime time mainstage slots at Coachella, Lollapalooza and Austin City Limits on the last campaign, the band have a headlining tour planned for 2019, including another two sold-out Red Rocks shows in July. In total, the band has performed 13 times on national television including appearances on Ellen, The Tonight Show With Jimmy Fallon, Austin City Limits and more.